As promised, I’m going to explain what drove me to really delve into Ancient Alien theory. I’ve always been kinda space-y. I blame lots of childhood scarring, including my Trekkie mom’s silver-framed USS Enterprise portrait lovingly hung above the sofa in our living room for five years, that enticing battery-smell on Disneyland’s Star Tours ride and my idolization of Princess Leia. So by my early teens ufology had already become a favorite research topic. But I’d never really thought much about aliens coming around to say hi to our ancestors. I don’t know why, I just never made the connection. In my own ego-filled mind, I figured we weren’t as interesting then as we are now. And then, one lazy Sunday afternoon a couple of years ago, I turned on History Channel. My eyes didn’t leave the screen again for almost four hours (curse you, Ancient Alien marathons!). I knew next to nothing about the theory save for those few short hours, but I was already pretty much hooked. Of course, I’m not exactly one to simply agree with a theory and go on my merry way. Though the evidence the show presented was extremely intriguing, I obviously had my reservations. So some ancient civilizations believed in Gods from the sky- that could be aliens, but there was no definite proof of them by any means (and if there were, I really wouldn’t be arguing my case for the theory now). But the more evidence the show presented, the more I couldn’t refute that something had to be going on. 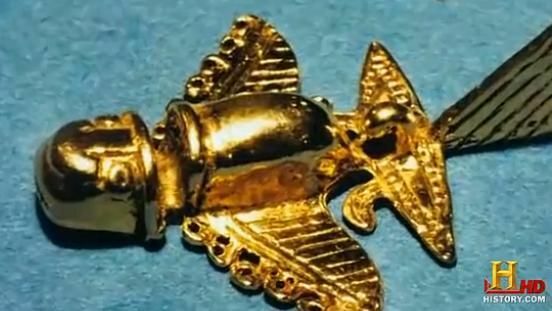 A piece of gold carved into an “insect” turned out to have the perfect dimensions to make it capable of flight. Idols of men who had either very Indian or African facial features were found in the ruins of an ancient South American civilization that supposedly was technologically unable to leave its home continent. And Puma-Punku? Yeah. Not normal. These strange objects and relics are found throughout the world, at the same time that ancient religions and myths told of Gods who came from the sky, then fought each other in flying chariots. The Chinese had begun to speak of flying dragons and a leader named Huangdi who came to Earth on a similar yellow dragon, only to spend one hundred years apparently initiating Chinese civilization. The Sumerian civilization mysteriously emerged 6,000 years ago with great technological advancements they attributed to the Annunaki, the star people who created humanity. Clearly something was going on, and the Cargo Cult phenomenon, which I’d mentioned in my last post, was really what drove the nail in for me. The ancients had to have seen something strange, that they could only describe using creatures and objects they already knew about. But could it be aliens? I still don’t know. Part of me believes it really could be, especially since so many cultures speak of people coming down from the sky. But it could just as likely have been an advanced, Atlantian-type human civilization that came into contact with the less-technologically inclined tribes. The one thing that always hits me at the end, though, is Sirius B. The Dogon people of Africa spoke of this star thousands of years before it was ever discovered (it’s invisible to the naked eye) and asserted that their creators came from that system. If you’re super skeptical about Ancient Alien theory, I suggest you look into that whole phenomenon. It’s very… interesting. Anyway, I know everyone has their own opinions of the subject, I just thought I’d share mine 🙂 Anyone who wants to add to or debate the idea is welcome, I’m always looking for new information and perspectives. quiet odd that you didn’t have any reply.